One of my favorite new things to make in my new Big Green Egg grill (thanks mom and dad!) is pizza. 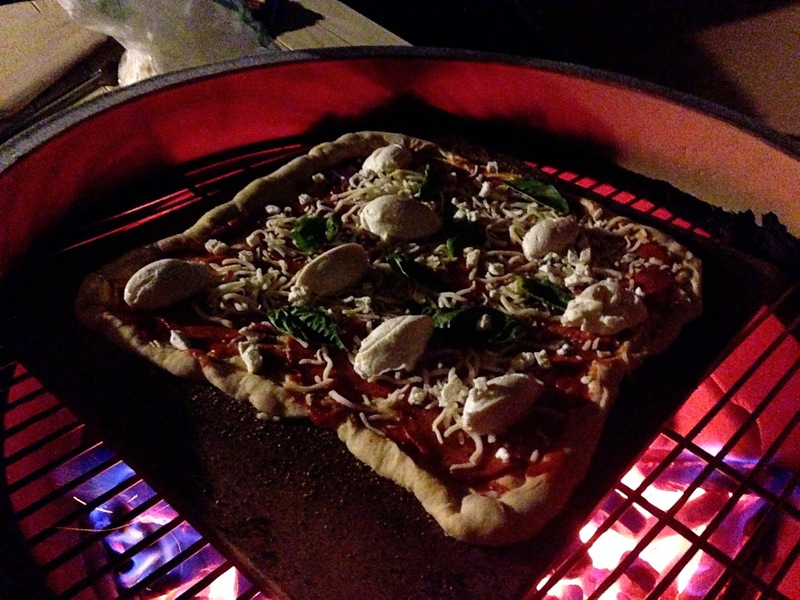 I've used my pizza stone for years in my oven but getting it out on the grill is like opening a whole new world of possibilities. ::insert Aladdin's "a whole new world" song here:: (and here are the lyrics - thanks to MetroLyrics.com incase you have no idea what I'm talking about) Anyway, what I love so much about using the grill is that it crisps up the perfect brick oven style pizza with that signature smoky essence. If you have a charcoal grill, I highly recommend you experiment with it and even try using lump charcoal instead of the Kingsford style briquettes. The lump charcoal doesn't require the chemicals or lighter fluid that the briquettes require and you get a cleaner char flavor. Combine the yeast with the warm water and let it sit for 8-10 minutes. Place flour, salt and garlic in the bowl of your stand mixer fitted with the paddle paddle attachment. Turn mixer to the lowest setting and begin pouring in the olive oil in a thin steady stream. Slowly add in the yeast water. 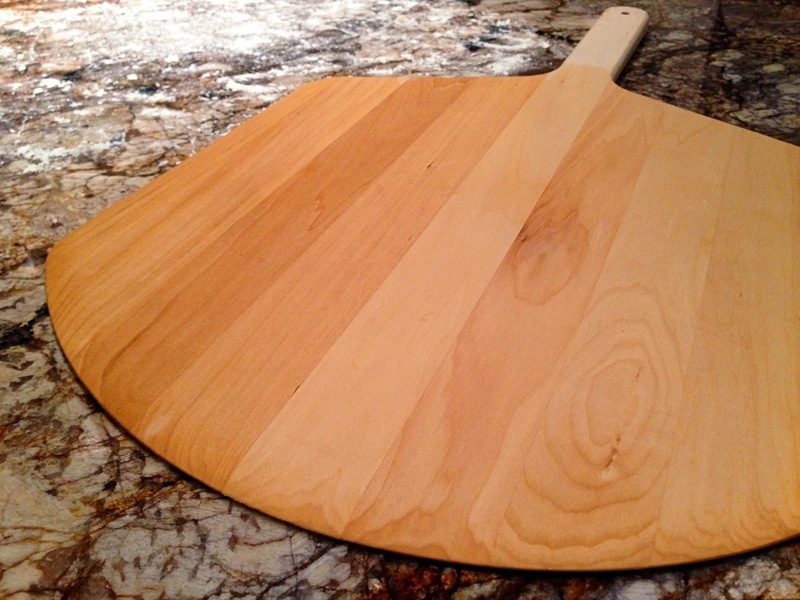 Once all ingredients are incorporated well, divide into 2 equal portions, transfer to separate bowls sprayed with Pam or lightly oiled, cover and let rise for an hour. 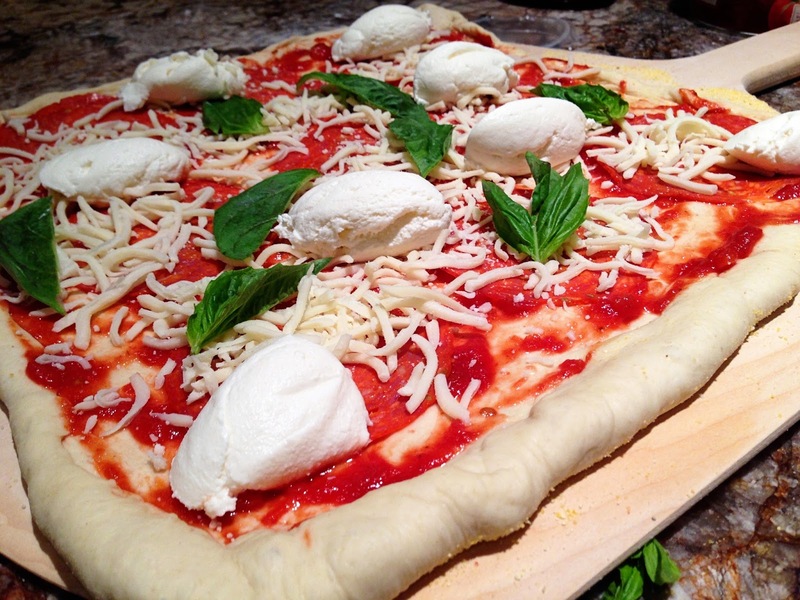 Preheat oven or grill to 425 degrees and insert pizza stone (if you have one). Combine the melted butter, garlic, oregano, basil and salt. 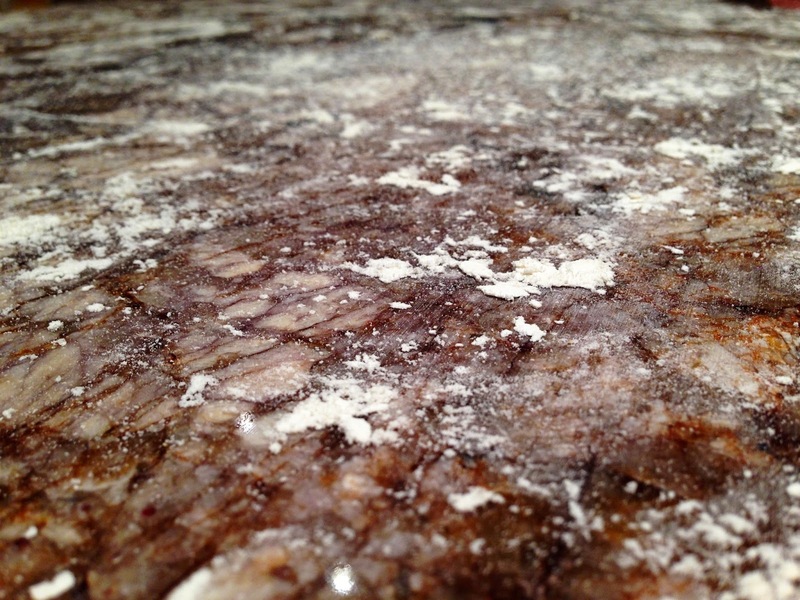 Lightly flour your work surface. Remove 1 portion at a time, lightly dusting the top with flour start using your fingers to press it out into the shape you desire. Avoid the center at first. Begin working just outside of the center pressing out all the way around a few times and then flip and repeat on the other side. Flip back over and now begin in the center working outward. 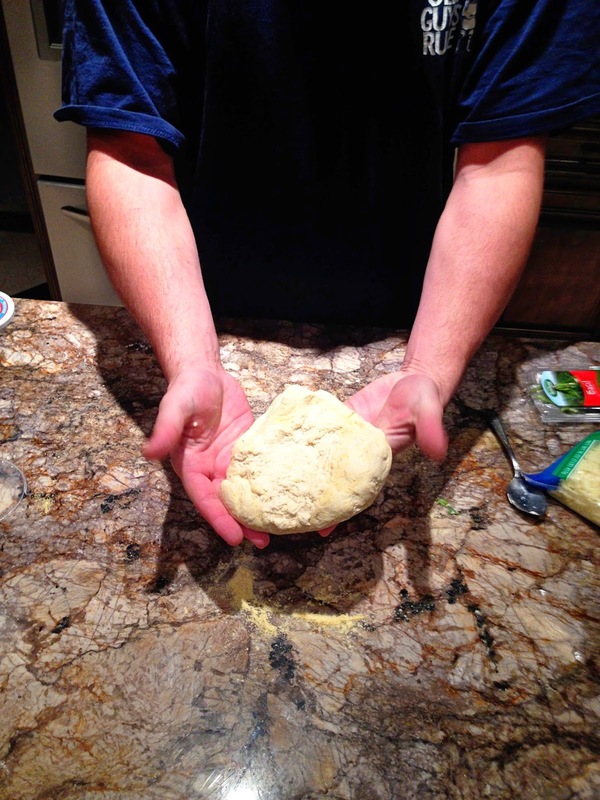 Repeat with the second portion of dough. Once you get them the size you want, mine are about 10-12 inches in diameter, place them on a pizza peel that has been dusted with corn meal or flour to keep it from sticking. 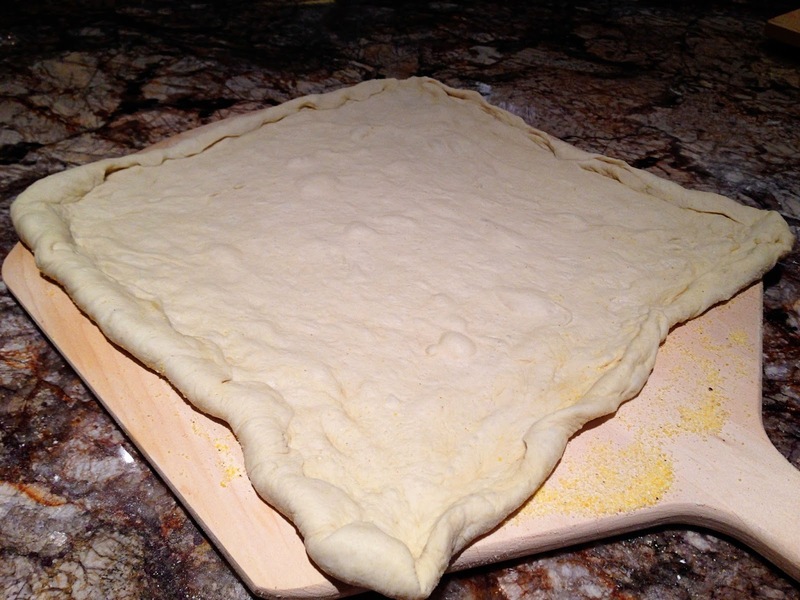 Shake it back and forth in small motions until the pizza starts to slide a bit. 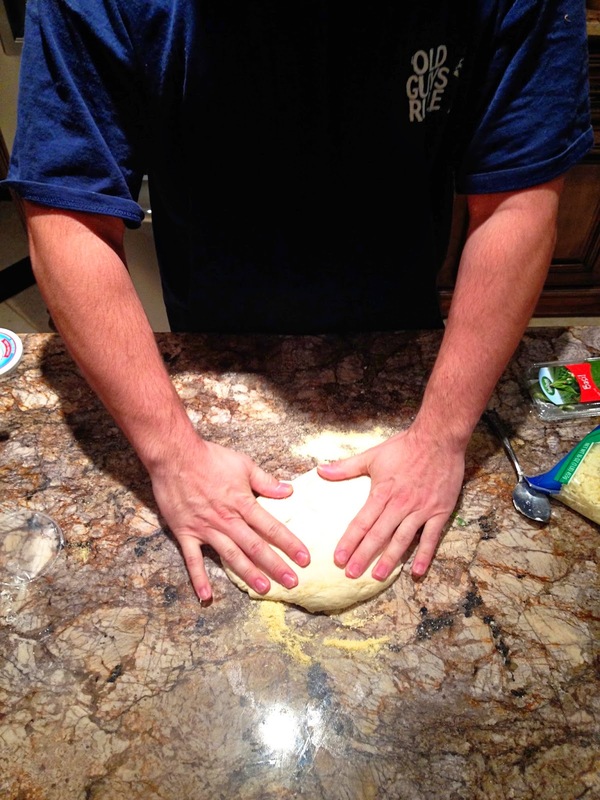 Use one forward and back motion to shake it out onto the pizza stone. Let cook for 8-10 minutes. While the pizza is cooking, sauté garlic and butter in a small sauce pan. 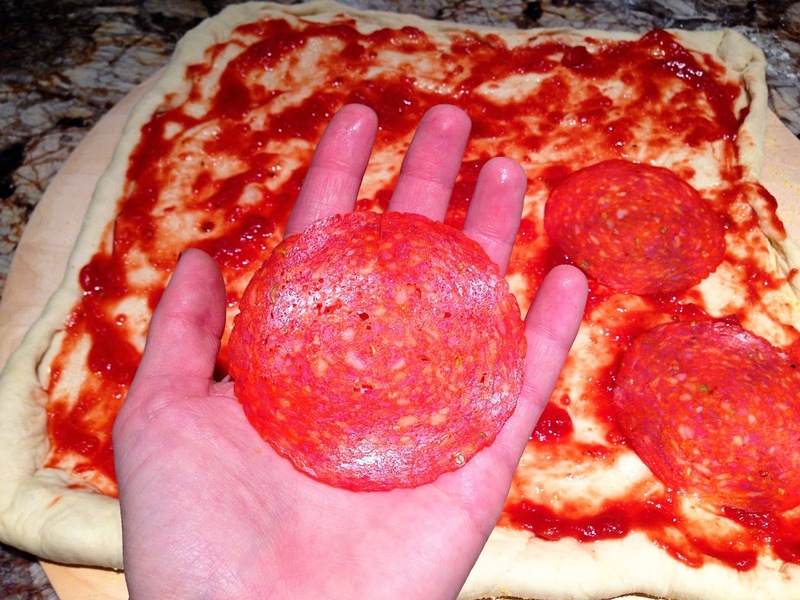 When pizza is done gently slide peel back under pizza and remove it from oven. Brush the crust with the garlic butter; cut and serve. 1. 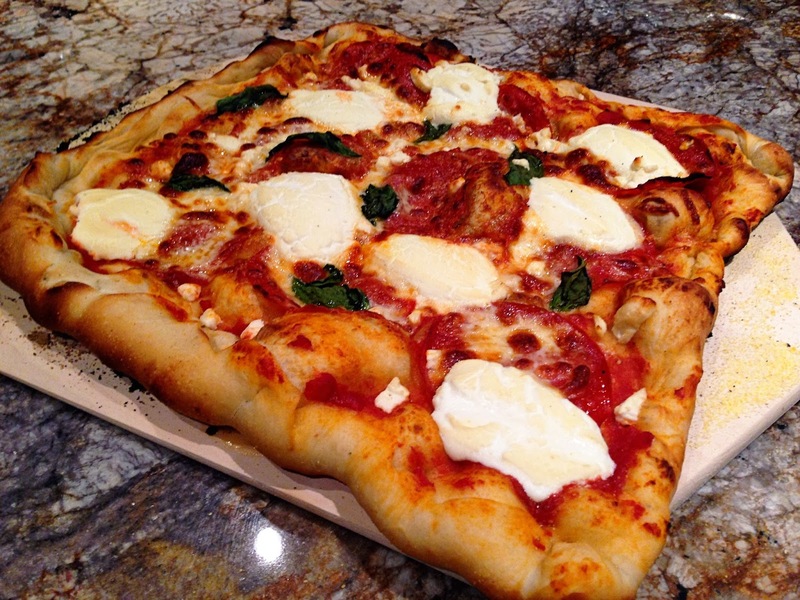 A thinner crust with fewer toppings needs less cooking time than a thicker crust with more toppings so keep an eye on it while it cooks. 3. 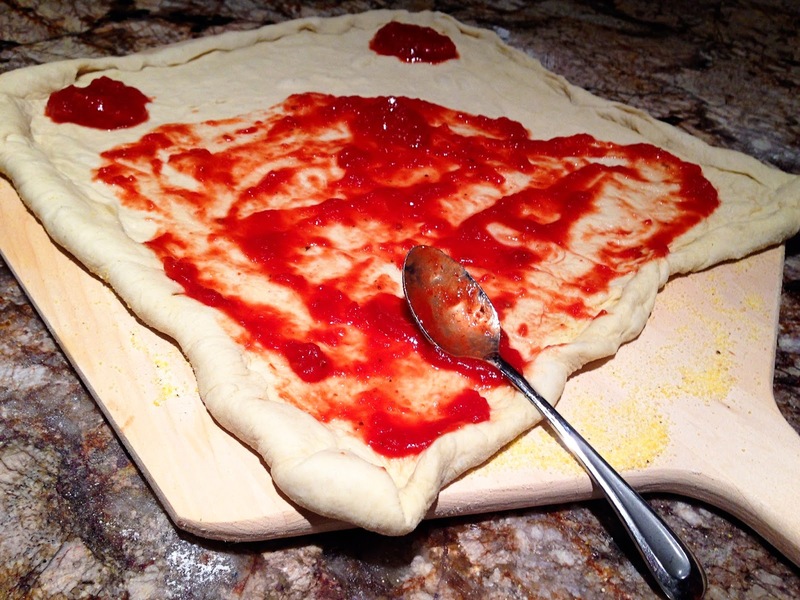 Don't use too much sauce or the crust will get soggy. 4. Get a chunk of mozzarella from the deli and shred it at home instead of buying the pre-shredded bagged stuff, you'll thank me for the creamy heaven you experience. 5. 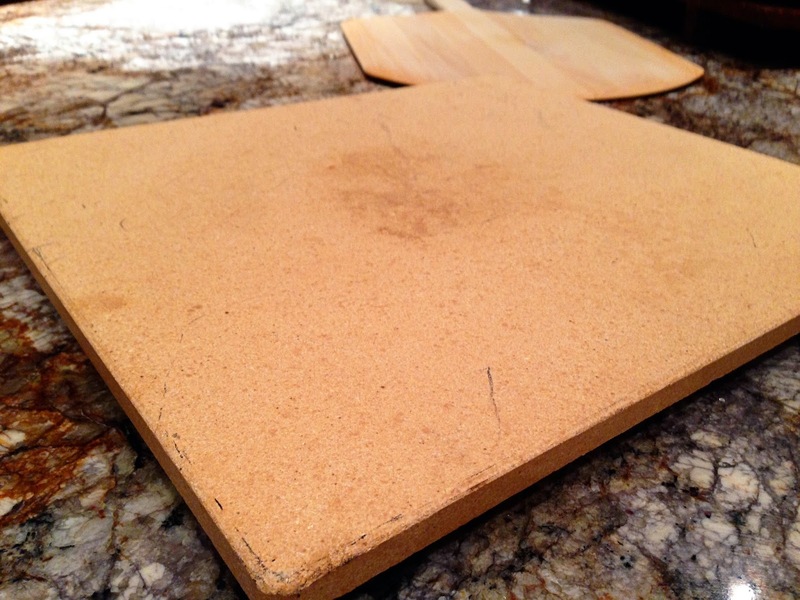 Make sure to get a pizza stone as they are relatively inexpensive. 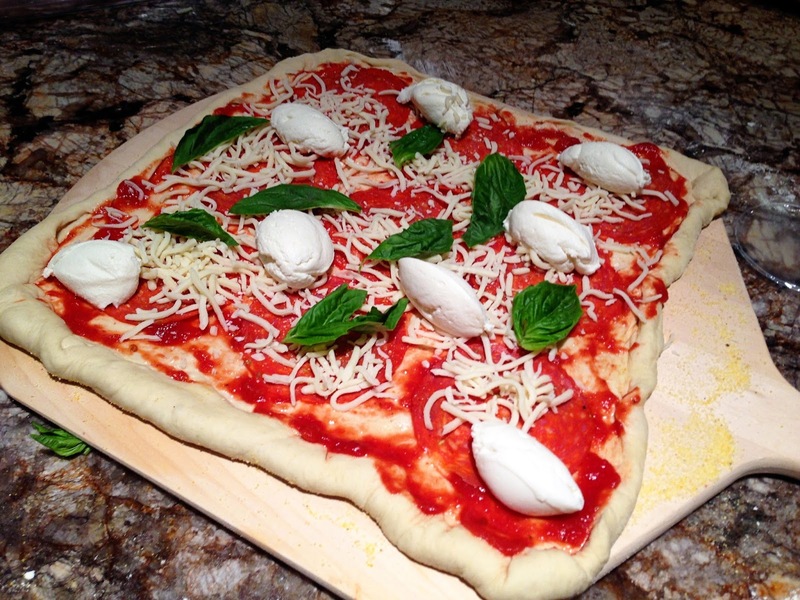 DO NOT put the pizza directly on the grill grate or oven rack, unless you love cleaning up messes! 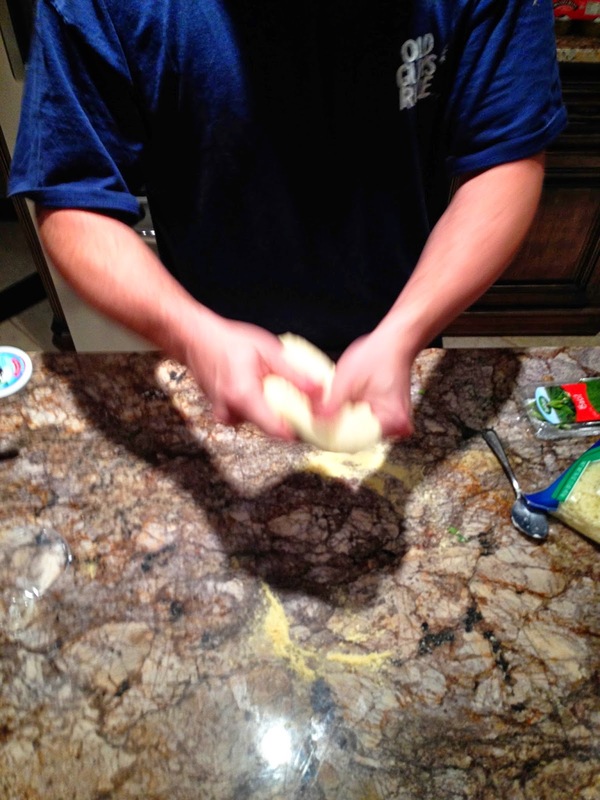 This is my husband trying to remember how he used to flip pizza dough when he was 14 and worked at a pizza place....Epic Fail, but I think he gets an "A" for effort!